Venice (ven'is) , Ital. Venezia, city (1991 pop. 309,422), capital of Venetia and of Venice prov., NE Italy, built on 118 alluvial islets within a lagoon in the Gulf of Venice (an arm of the Adriatic Sea). The city is connected with the mainland, 2.5 mi (4 km) away, by a rail and highway bridge. Between the islands run about 150 canals, mostly very narrow, crossed by some 400 bridges. 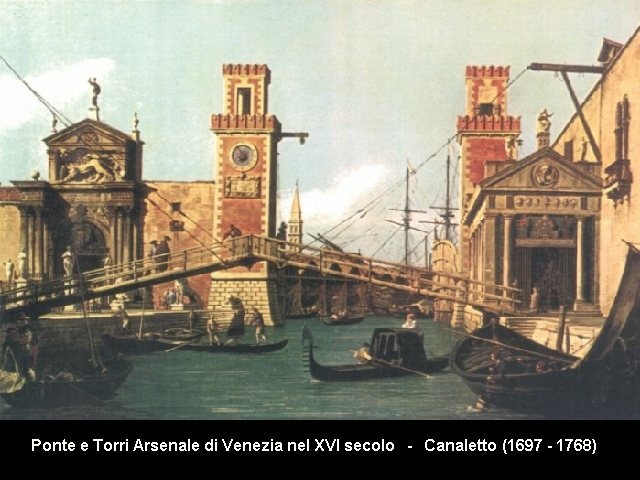 The Grand Canal, shaped like a reversed letter S, is the main traffic artery; its chief bridge is the Rialto, named after the island that was the historical nucleus of Venice. Gondolas, the traditional means of transport, have been superseded by small river boats (vaporetti), but there are numerous lanes (calles), public squares, and a few streets. Houses are built on piles. Venice is a tourist, commercial, and industrial center. The tourist trade is stimulated by many annual festivals, including ones devoted to painting, motion pictures, drama, and contemporary music. The Venice Biennale, which exhibits various kinds of modern art every other year, has been held there since 1895. Manufactures include lace, jewelry, flour, and Murano glass, and the city is a center for shipbuilding. Porto Marghera, the modern port of Venice (founded in the 1920s), located on the mainland, is a major shipping facility and also has considerable industry. The center of animation in Venice is St. Mark's Square and the Piazzetta, which leads from the square to the sea. On the square are St. Mark's Church; the Gothic Doges' Palace (14th–15th cent. ), from which the Bridge of Sighs (c.1600) leads to the former prisons; the Old and New Law Courts (16th–17th cent. ); the campanile (325 ft/99 m high; built in the 10th cent. ; rebuilt after it collapsed in 1902); the Moors' Clocktower (late 15th cent. ); the elegant Old Library (1553); St. Moses' Church; and the twin columns supporting the statues of St. Theodore stepping on a crocodile and of a winged lion of St. Mark (the emblem of Venice). On an island facing the Piazzetta is the Church of San Giorgio Maggiore (1566–1610) and on a nearby tip of land is the Church of Santa Maria della Salute (17th cent. ).Among the city's numerous other points of interest are the churches of Santa Maria Gloriosa del Frari (with paintings by Titian), San Zanipolo (1234–1430), and San Zaccaria (with a Madonna by Bellini); the Academy of Fine Arts, with fine paintings by Bellini, Carpaccio, Mantegna, Giorgione, Veronese, and others; the Scuola di San Rocco, with a series of paintings by Tintoretto; the Scuola degli Schiavoni, with paintings by Carpaccio; and the palaces Ca' d'Oro (1440; late Gothic), Rezzonico (1680), and Pesaro (1710; baroque). The fashionable beach resort of Lido di Venezia is on a nearby island. With Istria, Venice formed a province of the Roman Empire. In the 6th cent. refugees fleeing the Lombard invaders of N Italy sought safety on the largely uninhabited islands. The communities organized themselves (697) under a doge [Lat. dux=leader]. Favorably situated for handling seaborne trade between East and West, the communities grew, and by the 9th cent. they had formed the city of Venice.The city secured (10th cent.) most of the coast of Dalmatia, thus gaining control of the Adriatic, and began to build up its eastern empire, obtaining trade and other privileges in the ports of the eastern Mediterranean. The influence of the Middle East, particularly Byzantium, which characterizes much Venetian art and architecture, is most clearly expressed in Saint Mark's Church (rebuilt 1063–73), located on the city's principal square. In 1204 the doge, Enrico Dandolo (see under Dandolo, family), led the host of the Fourth Crusade (see Crusades) in storming Constantinople. Strategic points in the Ionian, the Aegean, and the E Mediterranean were taken, notably Crete (1216). The great traveler Marco Polo represented the enterprising spirit of Venice in the 13th and 14th cent. After defeating (1380) its rival Genoa in the War of Chioggia, Venice was indisputably the leading European sea power; its sea consciousness was expressed in the symbolic marriage ceremony of the doges with the Adriatic, celebrated with great pomp on the huge gilded gondola, the Bucentaur. All citizens shared in the prosperity, but the patrician merchants obtained political privileges. Membership in the great council, which by then had replaced the general citizenry as an electorate in the election of the doges, became restricted to an oligarchy. In reaction to an unsuccessful conspiracy in 1310, the Council of Ten (see Ten, Council of) was instituted to punish crimes against the state. The Ten, by means of a formidable secret police, acquired increasing power, and the doge became a figurehead.In the 15th cent. Venice, known as the “queen of the seas,” reached the height of its power. The city engaged in a rich trade, especially as the main link between Europe and Asia; all Venetia on the mainland was conquered; and Venetian ambassadors, creators of the modern diplomatic service, made the power of the city felt at every court of the known world. The arsenal (founded 1104; rebuilt in the 15th and 16th cent. ), where ships were built, was one of the world's wonders.The decline of Venice can be dated from the fall (1453) of Constantinople to the Turks, which greatly reduced trade with the Levant, or from the discovery of America and of the Cape of Good Hope route to Asia, which transferred commercial power to Spain and other nations to the west of Italy. The effects were not felt immediately, however, and Venice continued its proud and lavish ways. In the Italian Wars, it challenged both the emperor and the pope; the League of Cambrai, formed (1508) by Pope Julius II to humble Venice, merely resulted in a few minor losses of the city's territory; the naval victory of Lepanto (1571) gave Venice renewed standing by undoing Turkish sea power.The Renaissance marked the height of Venice's artistic glory. Architects like the Lombardo family, Jacopo Sansovino, and Palladio, and the Venetian school of painting, which besides its giants—Titian and Tintoretto—also included Giovanni Bellini, Jacopo Palma (Palma Vecchio), and Veronese, gave Venice its present aspect of a city of churches and palaces, floating on water, blazing with color and light, and filled with art treasures. Freedom of expression was complete except to those who actively engaged in politics; the satirist Aretino, the “scourge of princes,” chose Venice as his place of residence, and John of Speyer, Nicolas Jenson, and Aldus Manutius made the city a center of printing. The fall of Cyprus (1571), Crete (1669), and the Peloponnesus (1715; see Greece) to the Turks ended Venetian dominance in the E Mediterranean. Although the dramatist Goldoni and painters such as Tiepolo and Canaletto still made Venice the most original artistic city of 18th-century Italy, they represented to some extent the decadence that accompanied the city's commercial and military decline. 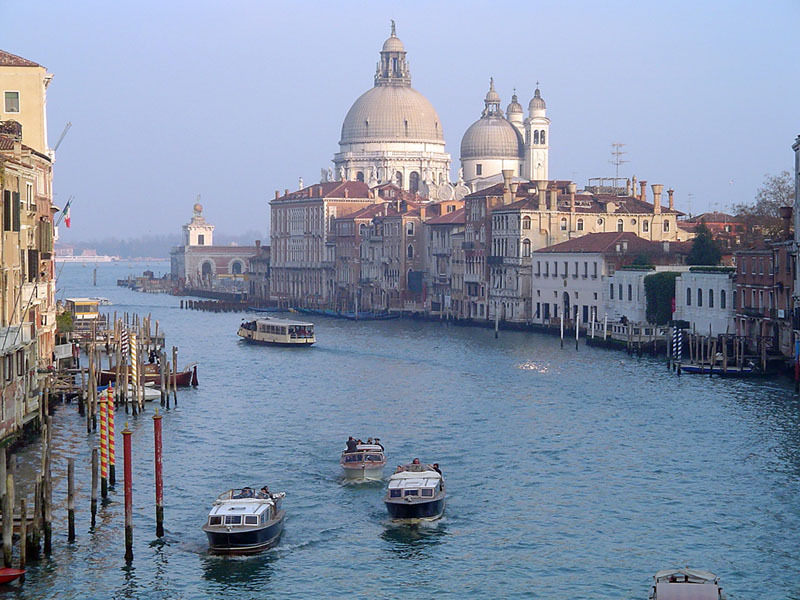 Politics in 18th-century Venice was aristocratic and stagnant. When, in 1797, Napoleon I delivered Venice to Austria in the Treaty of Campo Formio, the republic fell without fighting. During the Risorgimento, however, Venice played a vigorous role under the leadership of Daniele Manin; having expelled the Austrians in 1848, it heroically resisted siege until 1849. In 1866, Venice and Venetia were united with the kingdom of Italy.Since the 1950s, the city has been increasingly swamped by periodic floods, in part because it is sinking. Increased air pollution from cars and industrial smoke has contributed to the deterioration of the ancient buildings and works of art, and the high phosphorus and nitrogen content of the lagoon has stimulated algal growth, which has depleted marine life. Such environmental problems have led to a steady depopulation of Venice to the mainland over the past several decades. A major international aid program, begun in the mid-1960s by UNESCO, has searched for ways to preserve Venice; several government studies of Venice's problems have also been undertaken. In 1988, engineers began testing prototypes for a mechanical barrage, or sea gate, which could be raised in time of flooding to close the lagoon, and construction of system of sea gates began in 2003.